Cholesterol is a waxy substance found in some foods, such as red meat, butter and eggs, however is also made by the liver and found naturally in the body. Cholesterol is essential in maintaining good health, however, raised cholesterol is a risk factor for development of heart disease and other health issues. 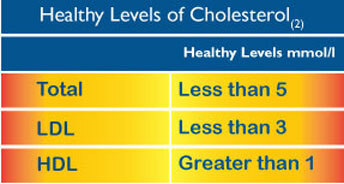 There are two main forms of cholesterol, LDL (low density lipoprotein) and HDL (high density lipoprotein). LDL cholesterol is often referred to as "bad cholesterol" because too much is unhealthy. It's important to measure and take action to maintain or improve your cholesterol level, particularly to support heart health.